Last week, a task force created to study DHS’ controversial “Secure Communities” initiative issued a report listing a series of recommendations to improve the program. Among other proposals, the task force recommended that federal authorities standardize the use of prosecutorial discretion around the country, make the program more transparent, and decline to initiate deportation proceedings against immigrants who have not been convicted of serious crimes or otherwise pose a threat to public safety. 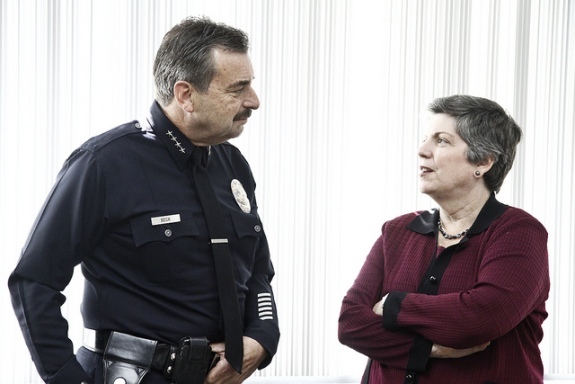 As of yesterday, those recommendations are one step closer actual implementation as the Homeland Security Advisory Council (HSAC) voted to approve the task force’s findings and submit them for further consideration to DHS leadership, including Secretary Janet Napolitano. While HSAC agreed (almost) unanimously to submit the recommendations to DHS, the committee was careful to characterize the findings as a good first step rather than a cure to problems with Secure Communities. The vote, in which only one advisory council member dissented, followed a series of endorsements from some of the most recognizable names in law enforcement. William Bratton, who previously served as New York City Police Commissioner and Chief of the Los Angeles Police Department, said he fully supported the task force’s recommendations and that the consistent exercise of prosecutorial discretion represented “the heart of the issue.” His remarks were echoed by Leroy Baca, the Sheriff of Los Angeles County. John Magaw, a former director of the ATF and the Secret Service, called the report a “huge step forward.” And Judge William Webster, a former director of both the FBI and CIA, said the report contained well-though out recommendations that should make the problems with Secure Communities clear to Secretary Napolitano. The creation of the task force was announced last June, along with the release of a two separate memoranda on prosecutorial discretion by ICE Director John Morton. Originally, the task force’s only assignment was to propose recommendations for cases of immigrants arrested for minor traffic offenses. However, task force members largely agreed that its report should address the program’s structural problems—including the misleading manner in which federal authorities rolled out the program, and the corresponding confusion in immigrant communities over the way its operates. The only member of the advisory council who dissented from Thursday’s vote—Manny Diaz, the former Mayor of Miami—said the task force’s recommendations did not go far enough. Diaz said immigration officials will never be able to consistently exercise prosecutorial discretion in different parts of the country, and that the program should be suspended entirely against all immigrants save those who are truly dangerous or pose a threat to public safety. His comments reflected the concerns of task force members who resigned in the days before the report’s release, arguing that Secure Communities should be suspended outright until it is fixed.